With more than two dozen companies in Pennsylvania manufacturing potato chips, it is no wonder that researchers in Penn State's College of Agricultural Sciences have developed a novel approach to more efficiently convert potato waste into ethanol. 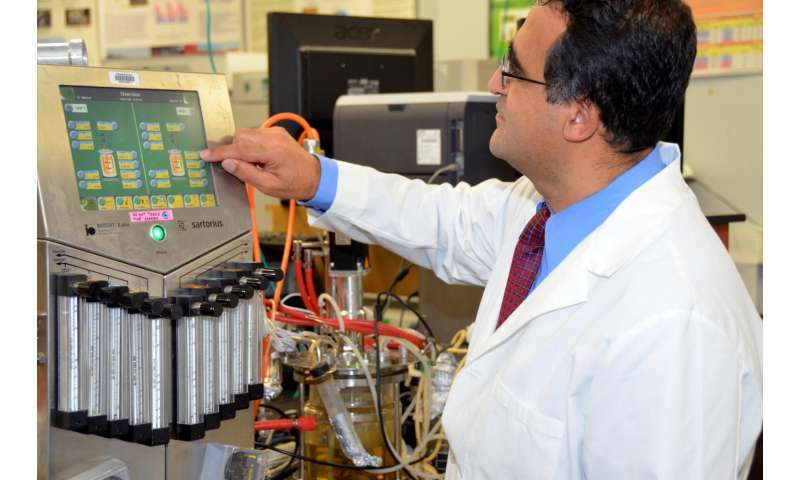 This process may lead to reduced production costs for biofuel in the future and add extra value for chip makers. 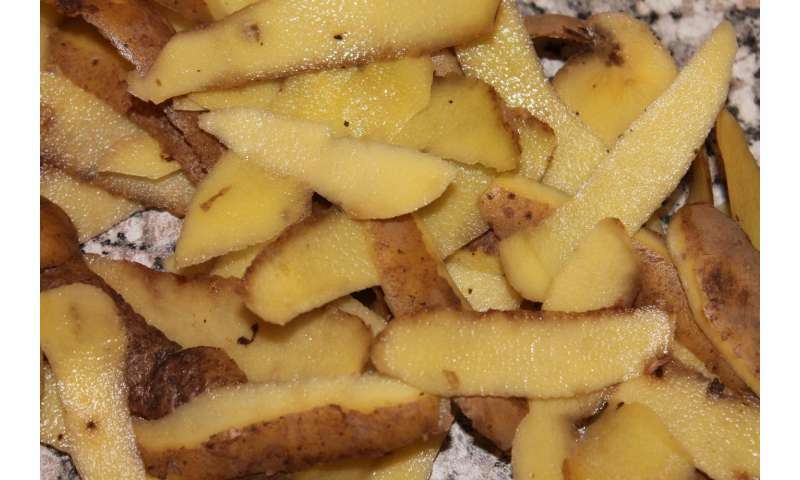 Using potato mash made from the peelings and potato residuals from a Pennsylvania food-processor, researchers triggered simultaneous saccharification—the process of breaking down the complex carbohydrate starch into simple sugars—and fermentation—the process in which sugars are converted to ethanol by yeasts or other microorganisms in bioreactors. The simultaneous nature of the process was innovative, according to researcher Ali Demirci, professor of agricultural and biological engineering. The addition to the bioreactor of mold and yeast—Aspergillus niger and Saccharomyces cerevisiae, respectively—catalyzed the conversion of potato waste to bioethanol. The bioreactor had plastic composite supports to encourage and enhance biofilm formation and to increase the microbial population. Biofilms are a natural way of immobilizing microbial cells on a solid support material. In a biofilm environment, microbial cells are abundant and more resistant to environmental stress causing higher productivities. In this application, these benefits were especially important because mold enzyme activity required higher temperature and the yeast had to tolerate this. Researchers evaluated the effects of temperature, pH and aeration rates in biofilm reactors, and the optimal conditions were found to be 95 degrees Fahrenheit and a pH of 5.8 with no aeration. After 72 hours, the researchers achieved the maximum ethanol concentration of 37.93 grams per liter. The yield was 0.41 grams or ethanol per gram of starch. "These results are promising, because the co-culture biofilm reactor provided similar ethanol production—37.93 grams per leader—compared to the conventional ethanol production—37.05 grams per liter—which required pre-treatment with added commercial enzymes at a higher temperature," Demirci explained. "Therefore, eliminating the externally added enzyme and energy costs will certainly reduce the cost of bioethanol production." Researchers also evaluated biofilm formation of co-culture on the plastic composite supports using a scanning electron microscope, said researcher Gulten Izmirlioglu, a doctoral student in agricultural and biological engineering when the study was conducted. "Scanning electron microscope images revealed that when mold and yeast are allowed to form a biofilm, hyphae (filaments) of the mold provide surface area for the yeasts' attachment," she said. "That's a good thing." 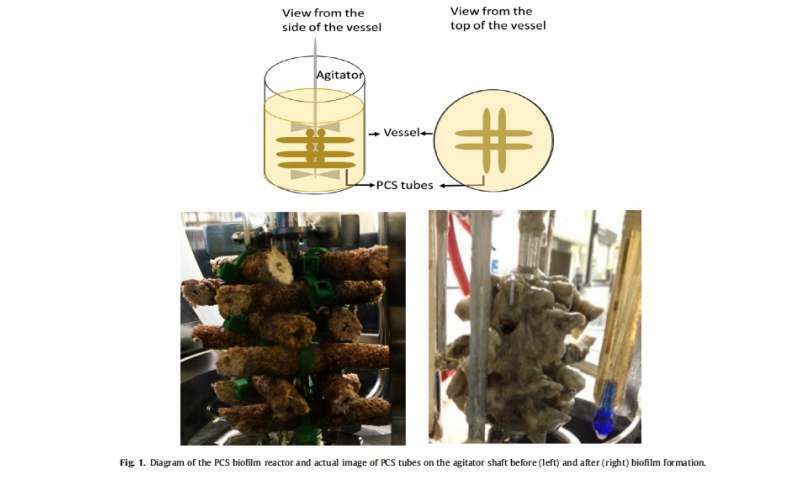 The research findings, which demonstrated that plastic composite supports can be used for simultaneous saccharification and fermentation processes in biofilm reactors with co-cultures when producing ethanol, were published in Fuel. Izmirlioglu believes the results are significant for industry. "Overall, bioethanol production from starchy industrial wastes can be improved with application of biofilm reactors, while the production cost is reduced with integrations of the simultaneous saccharification and fermentation process and co-culturing," she said. More efficient bioethanol production is needed to meet the demand for renewable energy and reduce the negative environmental impacts of petroleum fuel, Demirci noted. To make ethanol production cost-competitive, inexpensive, and easily available, feedstocks such as potato mash are needed, as well as improved processing technologies with higher productivities. "This research is of great interest to Keystone Potato Products in Hegins, Pennsylvania, a subsidiary of Sterman Masser Inc.," said Demirci. "The company is paying attention to this project, hoping this novel approach may help it add more value to its waste potato mash. Industrial food wastes are potentially a great substrate in production of value-added products to reduce the cost, while managing the waste economically and environmentally." Also contributing to the research was John Cantolina in the Microscopy and Cytometry Facility at the Huck Institutes of the Life Sciences, Penn State.